The ancient Indic philosophy of Vedānta harmonizes the truth as the original Organic Whole (pūrṇa). The non-dual truth of reality is seen by different sages as Brahman, Paramātmā, and Bhagavān according to the development of their inner spiritual life. Thus, the personal conception of reality is the higher vision. Modern science has also considered a more subjective conception of reality due to the progress in quantum physics. Thus science is undergoing a process of self-critique due to its own progress. The role of the observer is found to have a significance that was not found in the classical physics. 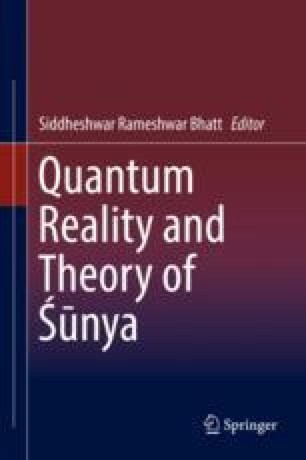 Although QM is not a science of life, it has given some hints that we cannot consider reality in the sense of naïve realism. The subject contributes to the object as much as the object contributes to the subject. The objects cannot be thought of as existing independently of the observer. Therefore the focus of science should be to study this relation between the subject and the object in everything. In this sense QM is advancement over conventional science. Further life process is essentially an organism and the parts are never independent of the whole. The parts are the inseparable members of the whole. The logic of life presents us a higher category in nature than physics and chemistry. Logic of machines, physics, and chemistry does not lead to living processes. Milton KA. Julian Schwinger (1918–1994), Homer L. Dodge Department of Physics and Astronomy, University of Oklahoma, Norman, OK 73019. Available at https://arxiv.org/abs/physics/0606153v1. Shapiro JA. Barbara McClintock, genome self-repair and cell cognition: a revolutionary vision for the future of biology. Huffington post. http://www.huffingtonpost.in/entry/barbara-mcclintock_b_1223618. Tilakaratne A. Director, Postgraduate Institute of Pali and Buddhist Studies, 133/19, Nawala Road, Narahenpita, Colombo 05 Sri Lanka. refer to the article: ‘Dependent co-originotion: the Buddhist approach to reality’, http://www.beyondthenet.net/slabs/articles/Dependent.pdf. Puri BM. Introduction to Hegel’s phenomenology. Available at www.gwfhegel.org. Kofler J, Ramelow S, Giustina M, Ursin R, Zeilinger A. Quantum experiment preludes the endgame for local realism – photonic Bell violation closes the fair-sampling loophole. http://www2.mpq.mpg.de/~jkofler/Files/Publications/Kofler,%20Ramelow,%20Giustina,%20Ursin,%20Zeilinger%20(2013)%20-%20Quantum%20experiment%20preludes%20the%20endgame%20for%20local%20realism.pdf.